Range Rover Evoque tuning and Range Rover Evoque ECU remapping Here at Viezu, we and our global network of dealers are proud to offer Range Rover Evoque tuning and Range Rover ECU Remapping. Such a formidable and reliable brand deserves the very best in engine tuning and ecu remapping technologies, in which Viezu really hits the target. It must be stated that when it comes to Range Rover Evoque tuning Viezu are indeed the world leaders. Our dedicated team of ecu remap software technical specialists create all of our Range Rover Evoque tuning maps in-house. We’ve secured our high standard of Range Rover Evoque tuning knowledge and expertise by heavily investing in research and development of Range Rover Evoque ecu remapping, and by honing our skills with hours of research and development with Range Rover Evoque dyno runs on our Mustang dynamometer rolling road. Viezu offer custom Range Rover Evoque tuning, styling and performance upgrades, our tuning can be custom tailored to ensure we meet your requirements. If you’re after an increase in throttle response and performance from your Range Rover Evoque tuning, our prestigious Range Rover Evoque performance tuning will seriously improve the drivability of your Range Rover Evoque. 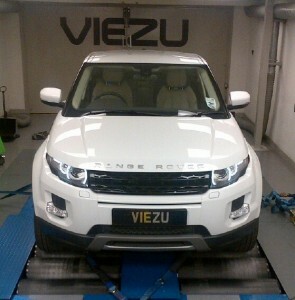 Or if you have fuel economy in mind, then Viezu’s BlueOptimize Range Rover Evoque economy tuning is for you. We can also accommodate you if you’d like a blend of the two, thus getting the best of both worlds. If your Range Rover Evoque is a petrol/gasoline engine, and want a bit more va-va-vroom, we can also create a custom remap for performance which will account for any additional Range Rover Evoque modification you have. Viezu have over 400 dealers around the world, and operate in over 42 countries. If you are looking for Range Rover Evoque tuning in our store, you can see this here.